Innovative Foundation Supportworks uses high-performance polyurethane coating for manhole sealing projects in Grand Forks and nearby in MN & ND. This highly durable coating will prevent inflow and infiltration while ensuring that every crack and joint in the manhole is permanently sealed. Our polyurethane coating services are available for manhole sealing, lift station sealing, and more, so don't hesitate to contact us! We proudly serve Fargo, Grand Forks, Bismarck, Minneapolis, St. Paul and nearby. Investing in manhole sealing now will prevent the need for costly and unnecessary manhole rehabilitation work in the future by providing complete corrosion protection. Manholes are under near-constant hydrostatic pressure, so it's important to avoid high-volume leaks. Our high-performance coating has been tested to show that no water will penetrate once it has been applied, making it ideal for protecting concrete surfaces from corrosion and abrasion. We restored this crumbling city sewer manhole with polyurethane coating, a manhole rehabilitation method that protects from corrosion. Completely weather and water resistant. Our polyurethane coating can handle climates of all kinds and resists weather damage, water damage, and concrete corrosion damage. 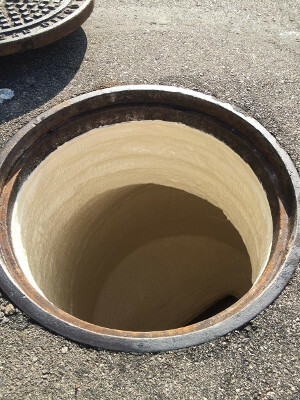 This sturdiness makes our coating the ideal solution for manhole sealing. Reduces water inflow and infiltration. Water infiltration treatment is very expensive, costing over $7,000/year just to treat infiltration from one ½” hole. Manhole sealing with our high-performance coating will stop the infiltration and save cities and municipalities money in the process. Highly durable to withstand pressure. City manholes need to withstand heavy vehicle traffic and foot traffic pounding as well as hydrostatic pressure from the side walls, all while resisting erosion. Innovative Foundation Supportworks' polyurethane coating will never peel, blister, or chip and will maintain its corrosion resistance for years to come. Fast completion of your project. Due to its fast application and cure time, our polyurethane coating will ensure that your manhole sealing project is completed in a matter of hours. If you're looking for a manhole sealing solution that meets code requirements, is flexible enough to withstand the expansion and contraction of substrates, and will remain resistant to water pressure and corrosion, Innovative Foundation Supportworks has the answer. Our high-performance polyurethane coating is available for manhole sealing throughout Minnesota & North Dakota, and our experts are ready and willing to help! Contact us today to learn more about our services or to schedule your cost estimate in Minot, Moorhead, Alexandria, Mandan, Dickinson, Fergus Falls, Jamestown or surrounding areas.